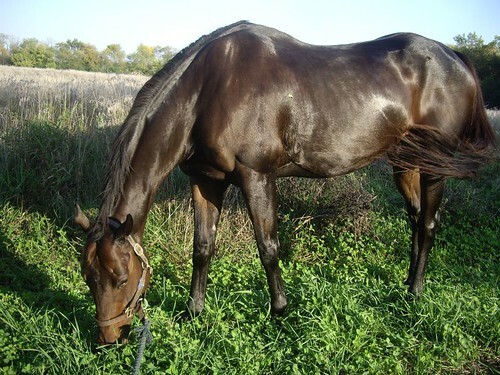 Jaguar Key is a grandson of Damascus, from the family of good sire Illinois Storm. 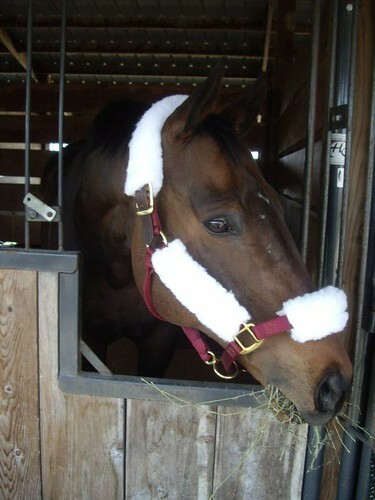 He raced 44 times, from ages 2 – 7, amassing winnings of over $200,000 along the way, while also tallying a couple stakes wins and setting a track record. 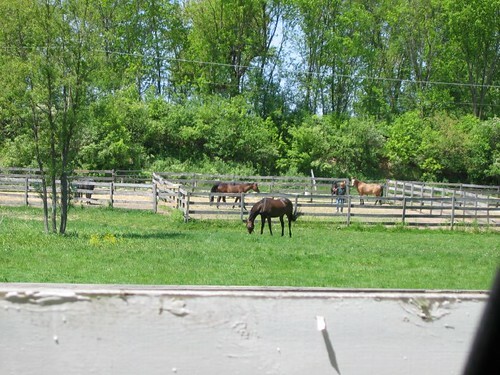 He was donated to a rescue charity called Wood End Farms by the folks that rescued him from slaughter, and it was at Wood End that I saw him for the first time in the spring of 2007. Jag arrived at Wood End in decent physical shape – he was sleek and shiny – but he was sore all over and generally, he wasn’t a happy guy. 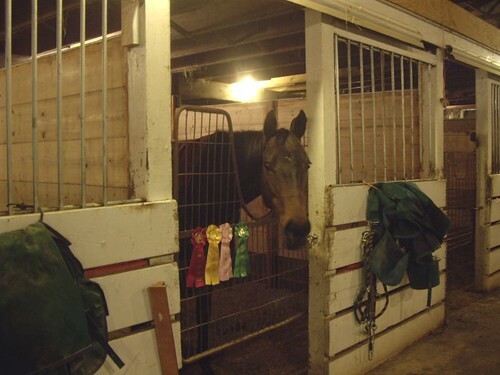 He lurked in the back of his stall and would only come to his door to greet you if you were prepared to make it worth his while (i.e. if you had a carrot in your hand.) He was tough to handle and could best be described as being a total grump. Jag, in his grumpier days. Wood End’s volunteers went to work on him, and I was part of that team. We worked on his ground manners, and nursed him back from the first of a series of self-inflicted injuries. 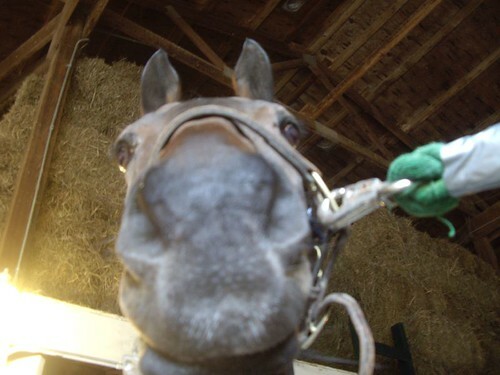 (Incidentally, as I write this, Jag is down one shoe and missing his halter.) 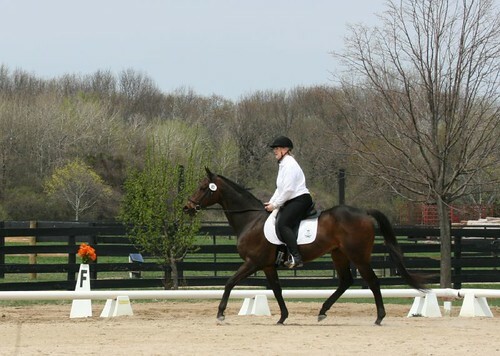 Finally, he started working under saddle. At this point, I’ll admit it, I was in love. 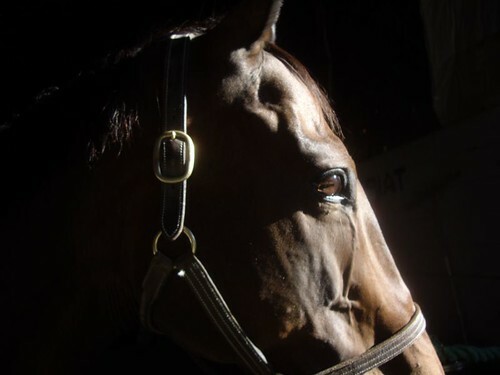 Jag’s grumpiness was abating, his eye was softer, and he looked fantastic under saddle – cute gaits and a the typical willing disposition you see in a Thoroughbred. 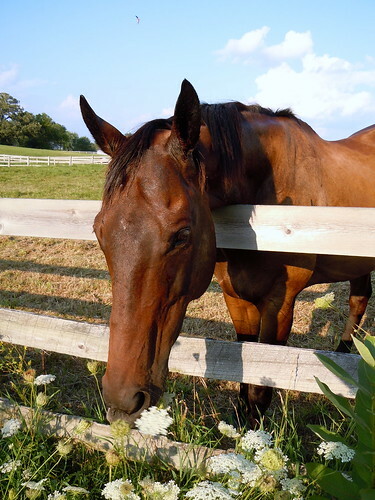 He was clearly feeling better – both physically, and about his surroundings. Now, time for another disclosure. 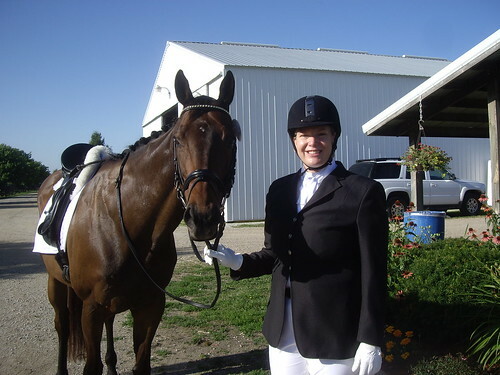 I started taking riding lessons – my first in more than 15 years. 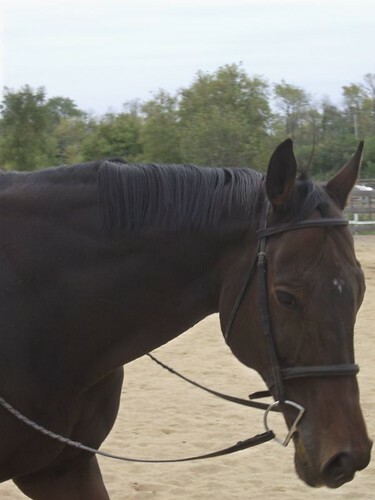 My unspoken goal was to ride Jag before we found a new home for him. 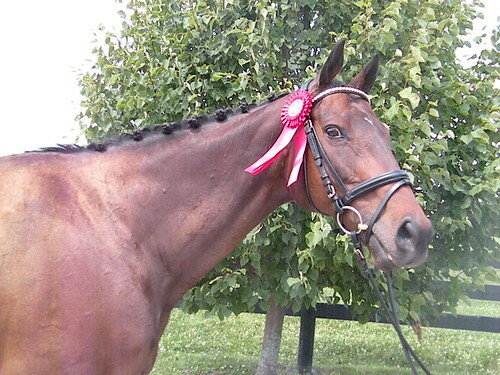 But given my skill level and the fact that I’d been out of the saddle for so long, that was a pretty lofty goal. 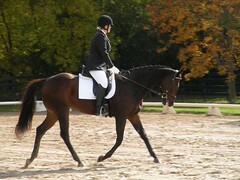 Within a few months, however, my trainer pulled him out of his stall for one of my lessons. I was overjoyed! 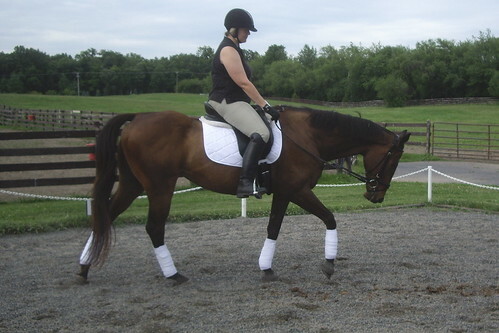 We were just about ready to promote his availability, and I was finally getting to ride him. 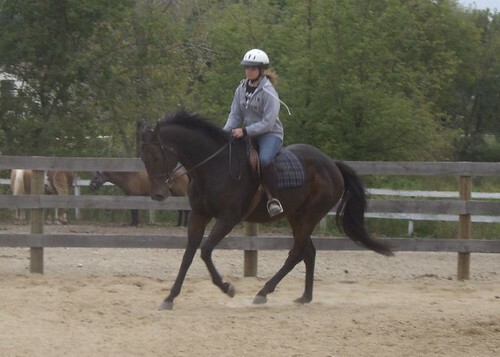 It wasn’t the greatest ride – I was grinning ear to ear the entire time, and also trying to deal with his bouncy trot. (I’m still trying to master that. Sit the trot? I don’t think so.) 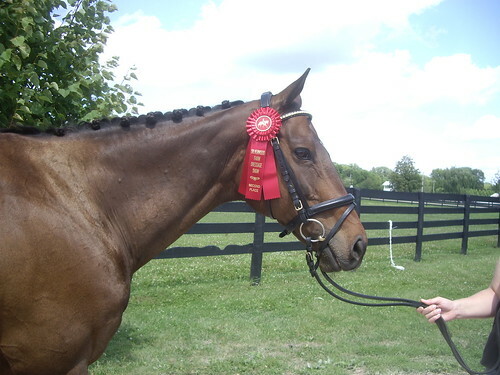 Despite his wriggly greenie behavior and bouncy trot, I knew when I got off him that this was the horse for me. He was quiet and sane. 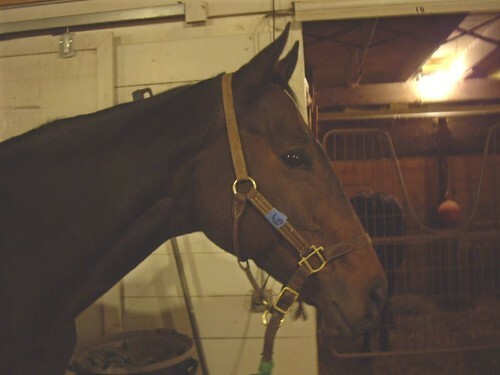 It was time to make my lifelong dream of owning my own horse come true. The husband took some convincing but finally acquiesced, and in January of 2008 I purchased Jag from Wood End. 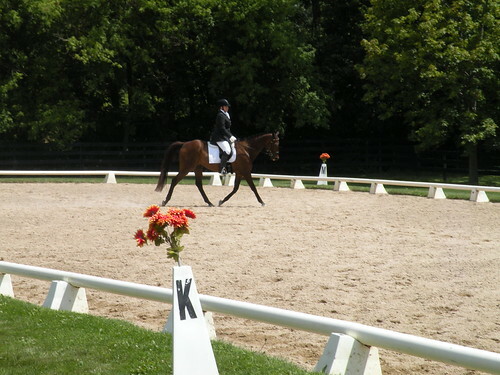 A few months after I bought him, I took Jag to a schooling show at Silverwood Farms in Wisconsin. 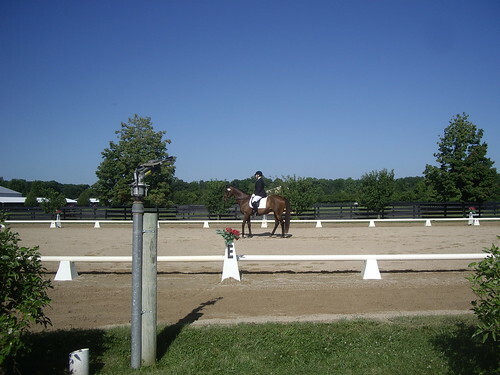 It was my first show, too, and I won’t kid you, I was terrified. And, clearly from an eq perspective – unprepared! As we were getting ready to make that first trip down the centerline, I felt panicky. 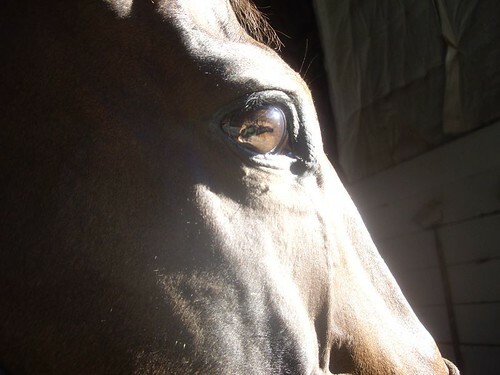 I wanted to throw up, burst into tears and most of all, get off the horse. I stuck it out, as you can see in this picture, Jag was the picture of cool, even as I hunched in terror on his back. 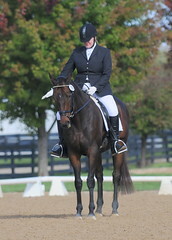 UPDATE October 2009 Jag and I went to two rated shows this year, after working with a dressage trainer on the basics. We got good feedback in the first, and our scores topped out at 62.5% at the Intro level. 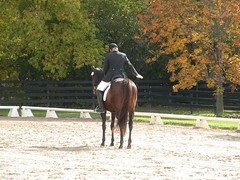 We went back home, worked on lateral suppleness, and then returned to the ring in early October. Results were much better! Jag was a star, even in challenging cold, wet conditions. We garnered three blue ribbons, and more importantly, got our best scores ever. It’s on to Training level for 2010. 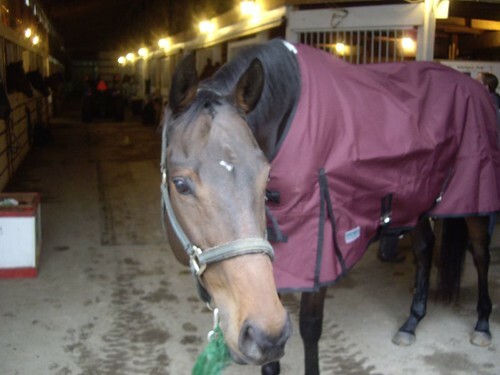 Jag is an extraordinarily playful horse, and will play with ropes, jolly balls, brushes and exercise balls. These videos – all taken on different days – show him playing with different toys. 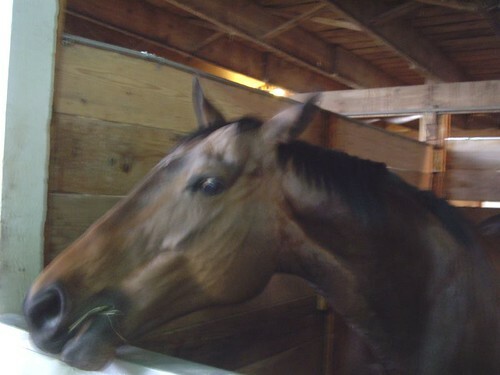 In early 2010, Jag was retired from riding, due to recurring kissing spines. 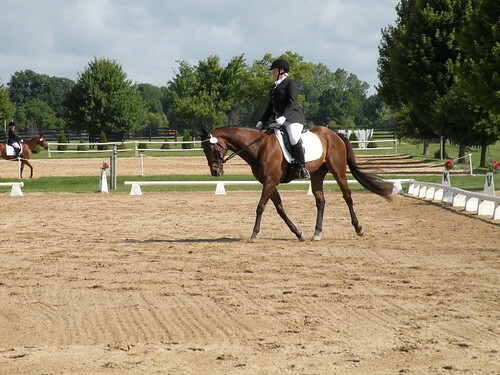 While I was sorry to have to retire him, I found him a great situation with Wyngate Equestrian, a gorgeous facility in southern WI that is home to Krause Sporthorses, breeders of premium KWPN jumpers. 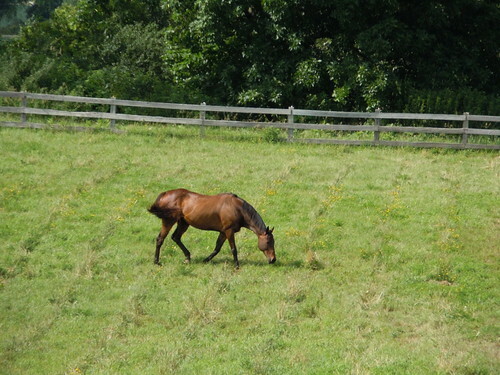 They had room to board a retiree, so Jag is now out on grass, almost 24×7. I visit him weekly, and he’s clearly happy and relaxed. 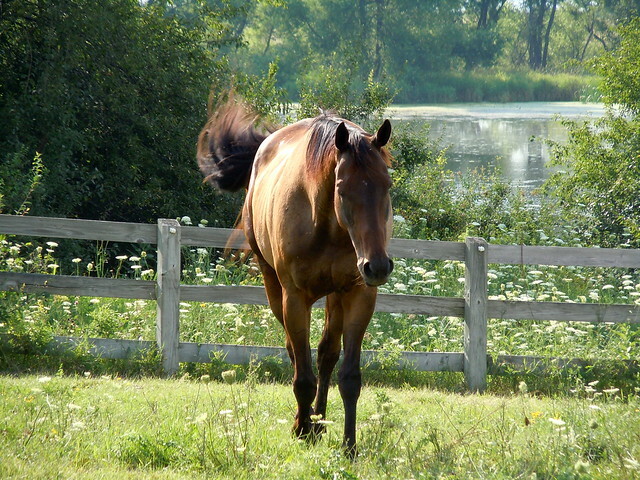 His mane is long and shaggy, his coat is completely bleached out, but in my eyes, he’s never looked better. 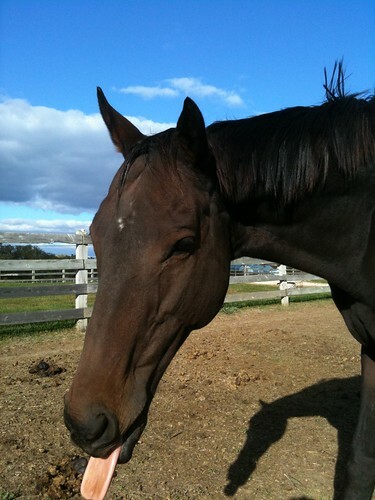 I miss seeing him each day, but feel blessed to be able to give him a much-deserved retirement.